The Motion in Place Platform was an infrastructure experiment which sought to provide a ‘deep’ mapping of reconstructed human movement. It was a collaboration between Animazoo, a Brighton-based motion hardware company, digital humanities and informatics researchers from the University of Sussex, King’s College London, and the University of Bedfordshire. Both 3D reconstruction and Virtual Reality (VR) in archaeology have been used to a great extent in the presentation and interpretation of archaeological sites in the past 20 years. However, there remains a predominant focus on their use as a means of illustration which, while enhancing the visual perception of the site, facilitates only passive consumption by the audience. This chapter reports on two linked experiments which sought to use motion capture technology to test the validity of digital reconstruction in exploring interpretations of the use of space, using domestic experimental round house buildings of the British Iron Age. Contemporary human movement was captured in a studio-based representation of a round house, and compared with comparable movements captured in an experimental reconstruction of the same environment. The results indicate significant quantitative variation in physical human responses to the two environments. This chapter is an updated and extended version of the following paper, published here with kind permission of the Chartered Institute for IT (BCS) and of EVA London Conferences: S. Dunn and K. Woolford, “Reconfiguring experimental archaeology using 3D reconstruction.” In S. Dunn, J. P. Bowen, and K. Ng (eds.). EVA London 2012 Conference Proceedings. Electronic Workshops in Computing (eWiC), British Computer Society, 2012. http://www.bcs.org/ewic/eva2012 (accessed 26 May 2013). Blades, H. (2012). 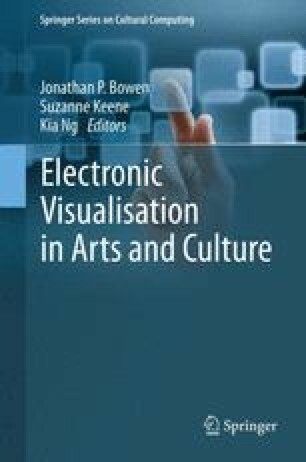 Creative computing and the re-configuration of dance ontology. In S. Dunn, J. P. Bowen, & K. Ng (Eds. ), EVA London 2012 conference proceedings (pp. 221–228). Electronic Workshops in Computing (eWiC), British Computer Society, 2012. http://ewic.bcs.org/content/ConWebDoc/46137. Accessed 22 May 2013.